Conservation of the hoard is well underway, with more than 80 objects conserved to date. 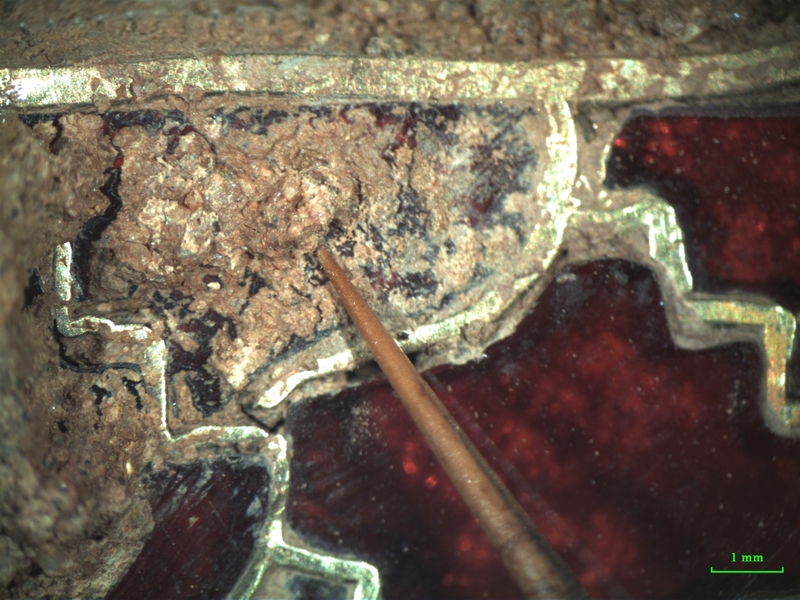 This blog post will describe the conservation of a beautiful gold and cloisonné garnet strip (Figure 1). Figure 1. Examining the strip prior to conservation. The microscope has a magnifying range of 7.5– 75x. Before conservation, the strip was almost completely covered with compact, sandy soil from burial. Due to the thick soil coverage it was difficult to assess the condition of the object, though some garnets with gold backing foils could be seen with the naked eye, and a piece of thin metal, apparently silver and from an unrelated object, was embedded in the soil (see top left corner of Figure 2). Figure 2. The strip before conservation. Note the piece of metal embedded in the soil (top left corner). After photographing the object and writing a condition report, I commenced removing soil from the front. I avoid using metal tools on hoard objects because they are harder than the hoard objects and can therefore scratch the gold and garnets quite easily. Steel pins and scalpels typically have a hardness of 7-8 on the Mohs scale (where 10 = hardest and 1 = softest), garnets 7-7.5, and gold 3-5 (depending on the alloy). Instead, for cleaning this object I used a wooden cocktail stick, a thorn mounted in a pin vice (see Figure 3), a soft bristle brush, and cotton wool swabs. The soil was quite hard, making dry removal difficult, so I applied a small amount of industrial methylated spirit (95% ethanol + 5% methanol) to the soil as needed to soften it prior to removal. Figure 3. Removing soil with a thorn. Magnification 15x. In Figure 4 you can see some empty cells and some cells containing only textured gold backing foils (top right corner). These foils were placed behind the garnets to reflect light, making the piece sparkle and the garnets appear bright as light is reflected back through them. Figure 4. The strip halfway through treatment. Soil removal proceeded systematically from right to left. Figure 5. Garnet measurements. Magnification 7.5x. Several of the garnets were loose in their cells and required application of adhesive to prevent them from falling out completely. For this I used Paraloid B72 (a strong, colourless acrylic adhesive commonly used in conservation) diluted with acetone. At the very bottom of each garnet cell there is a layer of what appears to be adhesive paste. 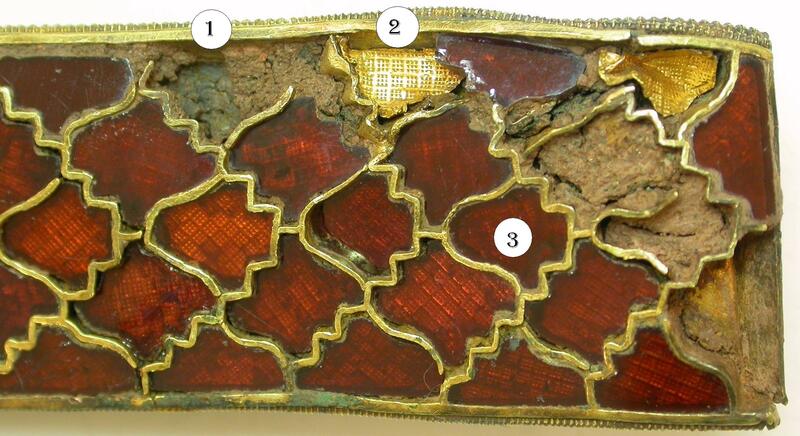 The Anglo-Saxon craftsman may have placed the foils and garnets on top of this base layer to help hold everything in place and position the garnets flush with the top of the gold cell walls. In Figure 6 you can see the layers of construction. 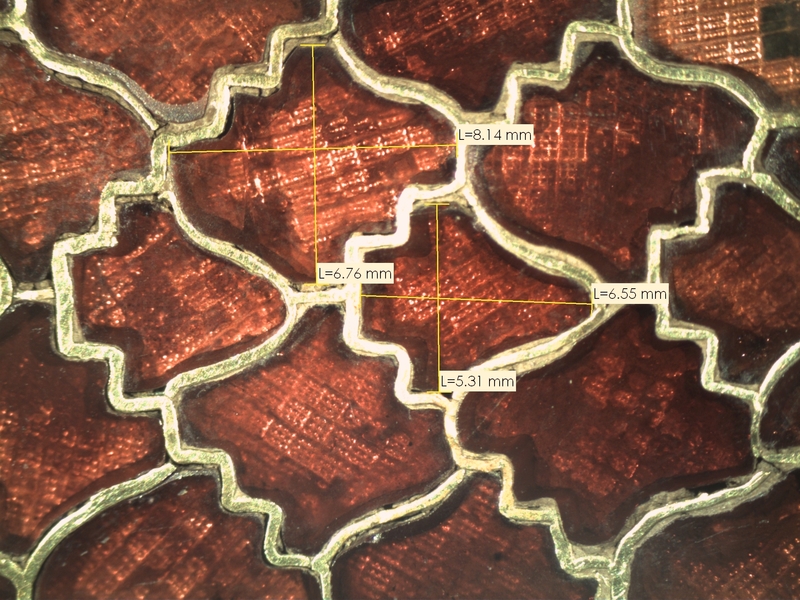 There is an exposed base/paste layer (#1), cells with foils but no garnets (#2), and intact cells containing garnets (#3). You can also see that some of the cells still contain soil (right side). This is because the garnets and backing foils are missing from these cells, and the soil is the only thing holding any remaining paste in place. We want to retain this paste so that it can be analysed in the future, so I left the soil in these cells to protect the paste below. Analysis of residues found in cells may yield some new information about Anglo-Saxon materials and manufacturing techniques. Figure 6. Section of the strip showing the different layers of construction. The treatment time for this object, including documentation, was 16 hours. The back of this object was not cleaned due to there being what appear to be further silver fragments or other materials embedded in the soil. At present, the goal of treatment is to clean the objects so that they can be seen and appreciated on display while not removing any material that may hold information vital to our understanding of the objects. We have a partnership with the British Museum’s Department of Conservation and Scientific Research to help unravel some of the questions emerging from conservation of the hoard. The original use/function of this object is currently unknown. In Figure 7 you can see deliberate gaps in the beaded wire edging where it may, at one time, have been attached to some other object. 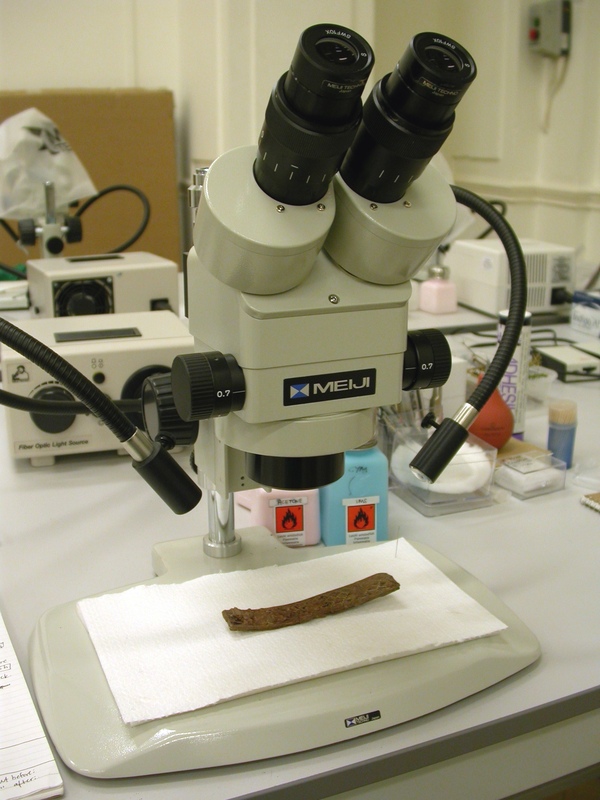 As soil is removed from hoard objects we uncover details that were not immediately evident. It is hoped that our understanding of the hoard will continue to grow as conservation work progresses, revealing the surface and structure of the objects which, in turn, gives researchers more to study. Figure 7. The strip after conservation. More conservation blog posts are to come, so stay tuned! If you have any questions or comments you can contact the conservation team (our email addresses are on the conservation team page of this site) or leave a comment on the Staffordshire Hoard’s Facebook or Twitter pages. Cymbeline Storey, Conservator, Staffordshire Hoard Conservation Team, Birmingham Museums and Art Gallery. if you ever want some volunteers to assist in carefully cleaning pieces of the hoard please ask, i would be happy to donate my time for free just to help out.